The Walking Dead: Survival Instinct puts you into the shoes of Daryl Dixon and tells of his adventure before the events of the hit TV show. 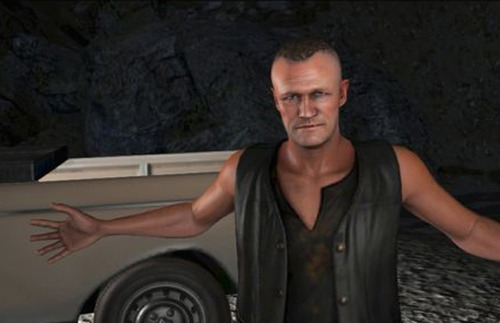 After walkers attack his camp, Daryl sets off to find his brother Merle and find a way out of the south. Despite a strong opening that really captures the tone of the TV show, Survival Instinct falls flat on its face in terms of narrative and story-telling the rest of the way. Absolutely nothing interesting happens in Daryl’s journey to escape the undead filled south. On your journey you will find several other survivors that you can talk to and in some cases, take with you. These survivors have almost no personality and add very little to the overall narrative. There isn’t even any attempt to stir things up or build any character relationships. This is pretty discouraging as The Walking Dead, in it’s other forms of media, has always been about building up characters and making you care for them or major set piece moments. This game has nothing. The game takes place in many different zones or maps which you drive to with your vehicle. You don’t actually drive but rather pick which destination to go to and you go there. This is where the game does some neat things. After the first couple missions the game lets you choose where to go next. Usually it is between two options and whichever option you choose not to go to, it will become locked out. You also can choose which type of road to take. The three options are: back-roads, streets or highways. Each have their own perks and draw-backs. Highways use less gas but back-roads have a better chance to stumble upon camps with resources. Whichever you choose you vehicle will sometimes break-down, run out of gas or blow a tire. Sound cool? Well it is at first. See when this happens the game tells you that you must find “X” to continue. You will then wonder around on a small map looking for “X.” The problem here is that the game uses the same map for almost everything non-story related. Whether you are looking for a new tire, a new car or gas, the game uses the same areas. They don’t even bother mixing up the item placement. After the first couple times of the game forcing you to do these fetch quests, it become boring and repetitive. This even extends to going off the path to find resources at a campsite. The game uses the same map and the resources you get are hardly worth it. I found myself skipping all of these missions after a few times because they had nothing of value and I grew tired of seeing the same map. Along your journey you can pick up other survivors and have them join you. When you start a mission you can then give them a weapon and send them out on missions. Each person has their own strengthens regarding weapons and playing to this reduces their chance of dying on the missions you send them on. This would be much better if the survivors had any kind of character and if the missions were rewarding at all. Again, I found very little use in this feature. The vehicles only have a certain number of seats so you may have to leave some survivors behind. I love this idea but again, the lack of character or any kind of cause and effect make this feature almost pointless. It’s almost like they wanted you to live with the decisions you made and question who to let go but in the end it doesn’t matter. None of the characters add anything to the game. 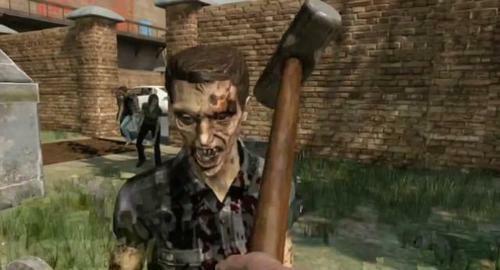 The game is played via the first-person perspective. I wouldn’t go as far as saying its a standard FPS as it does do a few things differently and is played at a much slower pace. The game wants you to take things slow and quite. You can stealth through all the missions and it can be a little satisfying. You can stealth kill walkers, kill them with melee weapons or use firearms. Firearms of course will attract the attention of any nearby walker and they will surround you pretty quickly. You can also pick up bottles and flares to distract the walkers. This would all be fine if it worked properly. Shooting is pretty clumsy, melee is very unsatisfying and the stealth kills get old after awhile. The enemy AI is also pretty bad and easily exploitable. You can run circles around them until you get the prompt to stealth kill them from behind. They will stand there and let you knife their face until they die with little resistance. It is almost comical. The game also has a “grapple” feature. 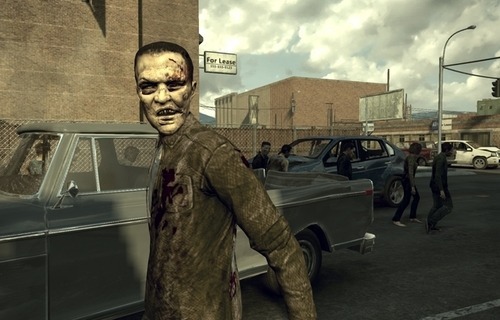 The walkers can grab you and you are then put into a quick-time like event to escape. You move a cursor around the screen until it’s over their head and pushing the button prompt on the screen. 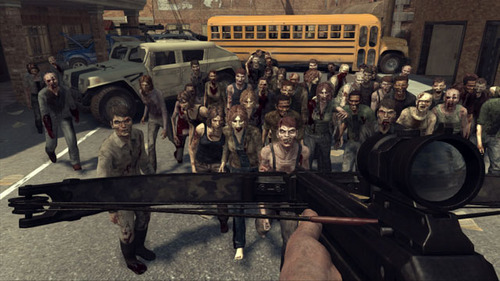 In some cases when the walkers surround you, you will go from grapple to grapple killing walkers. It’s like a massive walker group hug. The Walking Dead: Survival Instinct is also severely lacking on the presentation side. It is almost insulting by how little time was spent on the sound and visuals. The game graphically looks like a late PS2 game. Muddy textures, bad animation and just terrible attention to details just make this game seem like it was made over a couple months. It’s that bad. The game also has very generic sounds for everything. Both the guns and melee weapons just sound terrible. Norman Reedus and Michael Rooker so a decent job and chances are that if you like their characters on the TV show, then you will like them here. However, all the other characters are very poorly voiced. It does use the same theme as the TV show so I guess there is that. It is worth noting that the game is lacking a Co-Op feature. I was under the assumption in the months leading up to release that it would have some kind of co-op component but it doesn’t. Not like this would make the game better in any way. Why would you drag your poor friend into this game? Did he do something to make you hate him? The Walking Dead: Survival Instinct is an insulting product put out only to cash in on the upcoming series finale of the TV show. It has a few neat ideas buried amongst all the horrid atrocities that this game has to offer. This game has no doubt only been in development for only a few months. A few more moths may have helped some of the cooler ideas but we are stuck with this. The more unfortunate things about this is that it will no doubt sell reasonably well due to the mainstream successes of the TV show and Daryl’s character. If you want to play a good Walking Dead game, go play Telltale’s take on the universe. Avoid this game like the black plague. -Wasn’t there suppose to be Co-Op? I could not recommend this game if it were even a $5 downloadable game. One of the worst games in recent memory.